The purpose of this room set up and these A/V requests are to ensure you have the best event possible. Shari uses a microphone for all events with 20 or more attendees. Because of the excellent sound, Shari prefers using an over-the-mouth, lavaliere microphone. If an over-the-mouth, lavaliere microphone is not available, please secure a wireless, lapel, lavaliere microphone. If a wireless lavaliere microphone is not available, a handheld microphone is an alternative. No cord please. For conferences, rows work well. 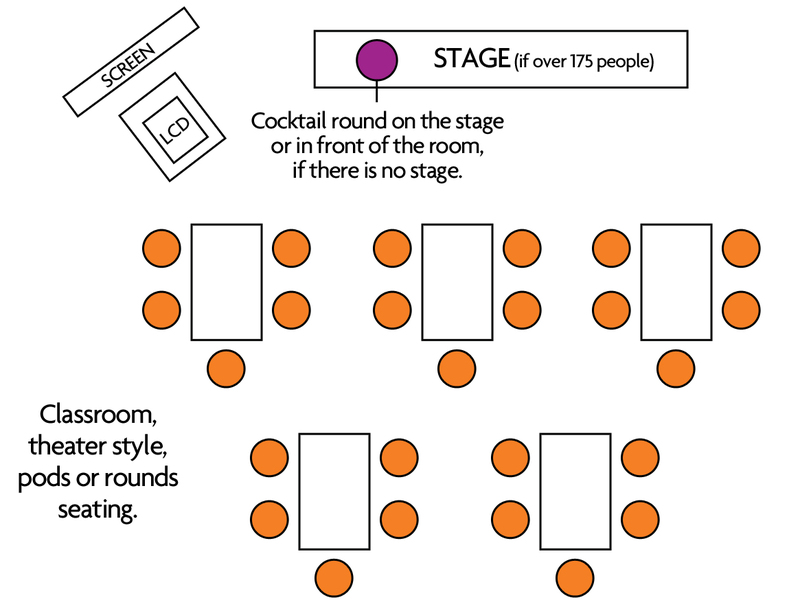 Rounds with crescent style seating with 5 or 6 chairs per table, so all participants can see the front of the room without having to turn their chairs, is fine too. See the drawing below. For training, pods or crescent style seating with 5 or 6 chairs per table is best. Please order 12’ to 18’ inch risers or a stage for Shari to stand on if there are more than 175 participants. Shari will use her own laptop. She uses a PC. Please ensure an extension cord with multiple plugs is available. The room should be as bright as possible/house lights full up. Please have a pitcher of water, without ice available for Shari. This isn’t meant to be high maintenance. Chewing ice and public speaking are a bad combination. Shari is a “wanderer” and doesn’t speak from behind a podium. If other speakers are using a podium, please place the podium on the side of the stage, if possible. Please have a cocktail table on the stage or in front of the room, if there is no stage, for Shari’s supplies. Nothing additional is needed on the stage – chairs, extra tables, etc. Please provide an LCD projector and a large screen. When possible, please set the projector and screen on the left side of the stage/room (when facing the front of the room), rather than on the stage or in center of the room. Having the projector and screen off to the side will enable Shari to walk around without walking in front of the projector. See the drawing below.